Weddings are all about personalization. Wedding Web sites tailored to the bride and groom may have started out as just a fad, but they are now fast becoming standard communication for many couples. 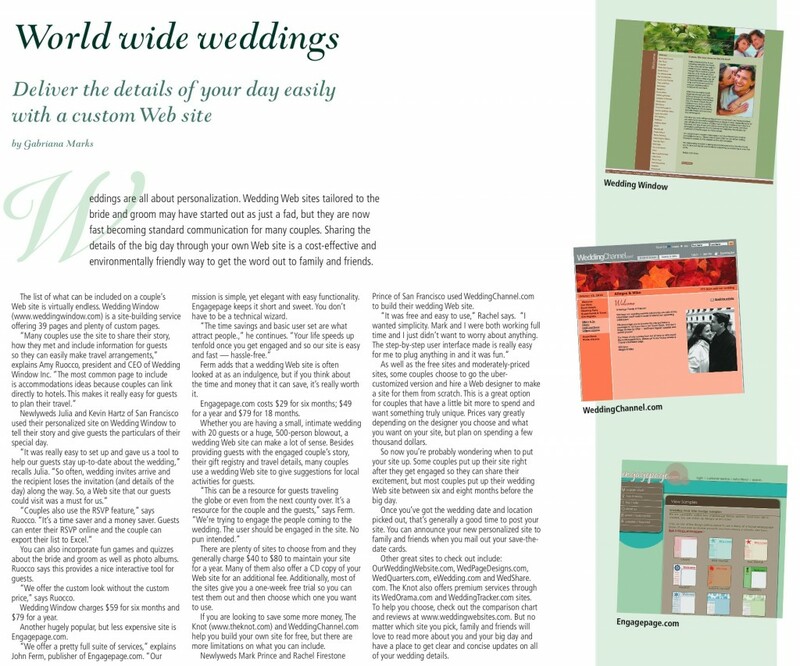 Sharing the details of the big day through your own Web site is a cost-effective and environmentally friendly way to get the word out to family and friends. You can also incorporate fun games and quizzes about the bride and groom as well as photo albums. Ruocco says this provides a nice interactive tool forguests. “We offer the custom look without the customprice,” says Ruocco. Wedding Window charges $59 for six months and $79 for a year. Another hugely popular, but less expensive site is Engagepage.com. “We offer a pretty full suite of services,” explains John Ferm, publisher of Engagepage.com. “Our mission is simple, yet elegant with easy functionality. Engagepage keeps it short and sweet. You don’t have to be a technical wizard. Ferm adds that a wedding Web site is often looked at as an indulgence, but if you think about the time and money that it can save, it’s really worth it. Engagepage.com costs $29 for six months; $49 for a year and $79 for 18 months. Whether you are having a small, intimate wedding with 20 guests or a huge, 500-person blowout, a wedding Web site can make a lot of sense. Besides providing guests with the engaged couple’s story, their gift registry and travel details, many couples use a wedding Web site to give suggestions for local activities for guests. There are plenty of sites to choose from and they generally charge $40 to $80 to maintain your site for a year. Many of them also offer a CD copy of your Web site for an additional fee. Additionally, most of the sites give you a one-week free trial so you can test them out and then choose which one you want to use. If you are looking to save some more money, The Knot (www.theknot.com) and WeddingChannel.com help you build your own site for free, but there are more limitations on what you can include. Newlyweds Mark Prince and Rachel Firestone Prince of San Francisco used WeddingChannel.com to build their wedding Web site. As well as the free sites and moderately-priced sites, some couples choose to go the uber-customized version and hire a Web designer to make a site for them from scratch. This is a great option for couples that have a little bit more to spend and want something truly unique. Prices vary greatly depending on the designer you choose and what you want on your site, but plan on spending a few thousand dollars. So now you’re probably wondering when to put your site up. Some couples put up their site right after they get engaged so they can share their excitement, but most couples put up their wedding Web site between six and eight months before the big day. Once you’ve got the wedding date and location picked out, that’s generally a good time to post your site. You can announce your new personalized site to family and friends when you mail out your save-the-date cards. OurWeddingWebsite.com, WedPageDesigns.com, WedQuarters.com, eWedding.com and WedShare.com. The Knot also offers premium services through its WedOrama.com and WeddingTracker.com sites. Article published in The San Francisco Chronicle‘s “Modern Bridal” custom publication in January 2008. Download PDF of original article to see full layout with PHOTOS!